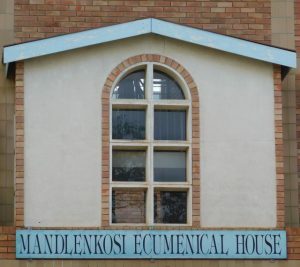 Last 14 November 2018, the Council of Swaziland Churches called for a press conference at their premises at the Mandlenkosi Ecumenical House (Manzini). While indicating reasons for celebrate, the Council also raises many concerns regarding the present situation of the country as they deeply affect the life of the people denying them the fullness of life Christ promised to all. The continued industrial unrest and patent tension between public sector associations and the government, stemming chiefly from the 6.5 per cent cost of living adjustment (CoLA) demand made by the former, has in our view degenerated from what should characterise a normal industrial negotiation process within the confines of a democratic society. One of the hallmarks of a democratic society is the right by workers to withhold their labour power and protest, of course within the rubric of well-defined and legally prescribed processes. The police service is vitally important to ensure that citizens and property is protected during such protests. It is necessary, as well, to ensure that in the exercise of their constitutionally guaranteed rights, workers are able to demonstrate without any fear of harassment from anyone, including law-enforcers, and that the workers also comply with any reasonable and lawful conditions which are agreed upon by all stakeholders. What transpired in what was supposed to be a three-day protest action was anything but what has been described. News of brutality on unarmed protesting workers by the Royal Eswatini Police Service, was rather disturbing. This was also the case with reports of workers not conducting themselves as expected and acts of vandalism during the protests. This then led to the National Commissioner of Police disallowing the continuance of the protest action as was initially planned by the workers. The church frowns upon such and wishes to condemn abuse of State power to stifle the enjoyment of guaranteed rights and freedoms. It equally frowns upon the abuse of rights which may lead to disorder and injury of persons and property. We thus encourage both the State and workers to endeavour always to amicably find lasting solutions, through the use of correct channels and institutions and taking care always to respect the law and uphold human dignity. We are encouraged by the Right Honourable Prime Minster’s initiative to call public sector unions to a round table and hope that such engagement will not be the last and that it will yield the desired results. We take this opportunity to congratulate the kingdom on having relatively peaceful elections over the last few months. We note, however, how once again this process has been marred by news of ritual killings by people who are believed to use human body parts to make charms to fortify their chances of going into political office. We condemn this with disdain and encourage the police service to do all it can to bring the culprits to book. Reports of electoral fraud and votes-buying is also of concern to us. We trust and pray that those responsible, who are not deserving of the title ‘honourable’ can be named and shamed so that the House is not occupied by people who lack integrity and honour. We note with grave concern, as well, how the election process has once again been conducted in total disregard, of past recommendations of regional, sub-regional and international observer missions that the kingdom needs to open up the political space in order to encourage pluralism, which is one of the pillars of democratic States. We were disturbed as well, by the new parliamentarians’ decision to sideline those who had lost elections in the process of electing senators, much against the court’s judgement issued to the contrary. Such blatant disregard of the rule of law by Parliament, in its very first day in office, was really concerning and hopefully was not a precursor of a culture of disregard of the law and court judgements. This may have serious political and economic repercussions for the kingdom. We congratulate His Majesty on the royal appointments in both the House of Assembly and Senate, as well as Cabinet. We note the political will to also ensure women representation but still have a concern that as a country, we are not complying to the tee with the constitutional imperatives. We respectfully call upon the country’s leaders to be the vanguards in defending and upholding the Constitution and remind them of the need to inspire confidence in, not only the kingdom’s citizens, but the international community as well, that the country respects the sanctity of law and does not disregard the citizens’ wishes as expressed in legislation, especially the Constitution. Section 2 of the supreme law is unequivocal in enjoining ALL of us to uphold and defend the Constitution. The CSC decries the bad state of the economy, which in its view, has largely been self-inflicted. This is due to government’s wanton spending on travels, vanity capital projects and corruption. This has led to businesses closing down and many emaSwati losing jobs and sources of livelihood after government failed to service its multi-billion domestic debt. There has also been reports of hospitals running out of drugs and food, to the point that members of the public and business community at some point had to come to the rescue of the country’s biggest referral hospital. Many emaSwati have suffered when government failed to settle bills with service providers in specialised medical care under the Phalala Fund, resulting in the service providers refusing to attend to patients. Another spin-off of this economic downturn has been government’s failure to offer anything to civil servants at the salary negotiation table, giving rise to industrial action by the former. We implore the new government to adopt a zero tolerance approach to corruption and ensure that all agencies charged with dealing with this scourge are adequately equipped to do what is expected of them. We call upon government, as it plans the next budget, to ensure that it prioritises social spending and comes up with a budget that addresses people’s immediate needs. We also call upon a moratorium of all forced evictions in the country and for the government to find a lasting solution to the issue of land as well as to proactively put in place programmes to ensure security of tenure and compensation to all who are deprived of their shelter in execution of court rulings. We call upon Parliament to enact laws that specifically provide for social security of the elderly and those with disabilities as well as a comprehensive law that regulates, in an equitable manner, the free primary education programme. As an organisation, we pledge our support to government and fervent prayers for a better Eswatini where all its people will have life and have it in abundance (John 10:10). Whenever positive strides are made in this regard, we will not hesitate to heap praise. We will, however, not flinch, whenever necessary, to speak truth to power and be a moral compass to the leaders and nation at large in execution of our prophetic duty as God’s ambassadors. We encourage all Christians in the country, to never cease praying for the kingdom and its leaders and to always condemn injustice in whatever form it presents itself, irrespective of who the perpetrator is. We take this opportunity, in conclusion, on behalf of the Executive Committee and Council of Elders of the Council of Swaziland Churches, to announce the appointment of Reverend Zwanini Shabalala, of the Evangelical Lutheran Church, as the Council’s new General Secretary as of October 2018. We appeal for cooperation from all member churches, government through the parent ministry for churches in the kingdom, other Sister faith-based organisations, the media and civil society as a whole to support Rev. Shabalala as he executes his duties in line with council’s mandate.